From "Korean Art Collection in the Brooklyn Museum" catalogue. The lotiform body is carved with a design of overlapping lotus petals framing leaf sprays. A pulled handle in the form of a lotus stalk is elegantly tied at the top with reeds. The cover is in the shape of an inverted lotus blossom, while the knob of the lid re-creates a lotus bud just beginning to unfurl. The cover and handle were originally joined by a chain, now marked by two loops, which are placed where a butterfly sitting on the cover would have connected with the insect's pupa on the handle. Dots of white slip accentuate the ornamental motifs. 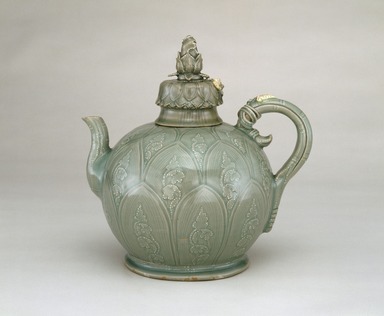 This decorative technique marks the earliest celadon wares of the twelfth century, just prior to the development of the slip inlay technique. This ewer's body is in the shape of a lotus blossom. The flower petals are arranged in four tiers, and carved in relief while the veins on the flower petals are incised. The band of lotus petals contains a honeysuckle design further embellished with dots in white slip. The lid is also decorated with three tiers of lotus petals with white slip coating, relief carving, and incision. The knob on the lid takes the shape of a lotus bud, which is accompanied by a butterfly made of white clay. Uniquely, the butterfly forms a pair with the triangular lotus leaf attached to the handle of the body. The butterfly appliqué is attached to a ring by which the ewer would have been connected to its matching cover. The shapes of the spout, handle, and foot are derived from a bamboo motif and sumptuously decorated by the techniques of incision, slip coating, and appliqué. The absence of the Goryeo dynasty's unique inlay technique shows that the ewer was made in the mid-twelfth century. The highly refined clay body and glazing, use of silica for kiln stacking, general figure of the ewer, and the various techniques used for decoration make it a truly fine work of art.